The British Gazette » The dangers of hives. These brave men valiantly served the British Empire for generations and continue to serve the British Crown. There are those who refer somewhat dismissively to these men as “mercenaries”. That their loved ones are nearly always Nepalese and not Britons on the UK electoral role, it is to the credit of contemporary British politicians – Tony Blair included – that these people have not over relied on the service of the Gurkhas. Many contemporary British politicians have developed a fondness for the “military adventure”. The politicians however are not the ones who “get stung” – the dubious pleasure of that experience they leave to the military! Of course the General will point out to these folk that fatalities (one’s own) are nearly always a consequence of taking military action! This is one reason why billions of US $ have been spent developing sophisticated unmanned aerial vehicles or “UAVs” – commonly referred to as “drones”. This is because whilst the aircraft maybe flying over the dangerous skies of Afghanistan it’s controller or pilot is safely ensconced in a bunker in the USA or UK or elsewhere, thousands of miles away from the battlefield. This is why the recent thwarted terrorist attack took place in East Anglia. The terrorists wanted to visit death on those who piloted the drones. Of course, there is a sound military logic for unnamed fighting machines as well as the political logic. This is because it can take longer to train a skilled pilot than it can to manufacture an aircraft. Thus it is shortages of skilled aircrew rather than actual aircraft that can limit an air force’s effectiveness. This was most significantly illustrated during the war in the Pacific in WW2. During that conflict the Imperial Japanese Navy lost most of it’s skilled pilots after Midway, for unlike the USN they did not spread their skilled pilots around enabling them to pass their skills on to newer pilots. Instead the IJN kept the experienced pilots together in elite air groups, so once lost they were not easily or quickly replaced. One thing British Gazette readers will be aware of is the development of technology. They will also be aware that certain things such as computers and TVs are taking on some of the other’s attributes/characteristics. For instance, one can watch TV on one’s computer as well as make telephone calls. Conversely, there is now something called a “smart television” on which the TV’s owner can access the internet. Then we have smart telephones on which you can use as a telephone but also as a computer and a television! Well it seems that the aim of the military engineer and scientist is to develop an aircraft with a tremendous computing capacity that will result in the traditional autopilot that used to have the nickname “George” with what they are calling a “pilot’s assistant.” This pilot’s assistant – the aircraft itself – will be able to assist and in some cases take over from the pilot. 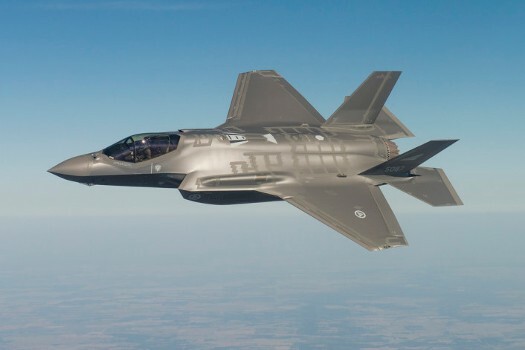 This aircraft, the F-35 Lightning II, is being developed at tremendous cost to the very hard pressed and long suffering United States taxpayer by Lockheed Martin Aeronautics for the USAF (F-35A), USN (F-35B) and USMC (F-35C). The F-35 took its first flight on 15th December 2006. It is however yet to be fully operational. This is because Lockheed Martin have had tremendous problems developing it. Principally with the computers, software and flight control systems. As well as years behind schedule, it is also US $ billions over budget. “What the heck has this to do with bees and hives?” We hear you ask Dear Reader. Any person who has been associated with military avionics will immediately realise this report is utter nonsense. However – that is not to say that there is no danger here. This is because the United States had planned to buy 2,457 aircraft. How many will actually end up in squadron service is yet to be known. In yesterday’s article we described how a “hive mind” which Electrical Intelligence would be fundamentally different from our intelligence, which is Biological Intelligence. This morning in the parish church, there were four ladies and one gentlemen in a pew in front of me. These worshippers were all graduates and let us say they have IQ’s of 145 which is typical of someone with a good honours degree. That means their combined IQ was 580. Did they then constitute an entity with superhuman intelligence? No of course not! They were four intelligent middle class graduates. However, a supercomputer with the ability to learn and to learn by linking to other such computers is something that is capable of being constituted as a hive mind. At the moment such a computer MIGHT have the intelligence of a field mouse. Now whilst 2,457 field mice can never equal a single human mind, one has to ask the question: Can 2,457 F-35s as a hive mind equal a single human mind? Or exceed it? The answer at this stage is probably not. However, it is likely that the F-35’s successor, which is possibly already on the drawing board, will be a UAV – with a significant autonomous capability.